The St.Kitts and Nevis economic boom is set to get even bigger with the construction of a new massive multi-million dollar Hotel project. Saturday November 11th was the ground breaking of the Seaview Gardens Hotel Community Project in Camps, St.Kitts. 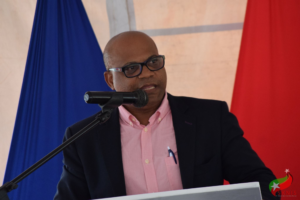 The EC$326million project officially broke ground at a ceremony which featured presentations by Prime Minister Dr Hon Timothy Harris and Minister of Tourism Hon. Lindsay Grant. The Developers and investor team on the project is led by Alex Lee an economic citizen of the federation. The project represents a Direct Foreign Investment of over US$120 Million. It will encompass 20 acres of 700 units including a 350 room hotel, Condominiums, Villas , Casino, Commercial and Residential spaces and recreational areas. It is anticipated to run over a 5 year construction phase providing jobs for hundreds . All phases of the project is expected to be complete by 2022. In addressing the Ceremony Minister of Tourism Hon. Lindsay Grant thanked the developers and investors in the project and highlighted their background . 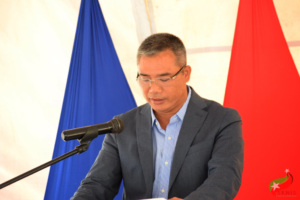 Minister Grant also indicated the processes adapted by Government to ensure that the project was one of an extremely High standard and one that would provide short term and long term benefits to the country. “The Cabinet is pleased to have granted approval for this project to be designated an “Approved Project” under the Citizenship by Investment Programme. This approval followed a thorough review process by the CBI Projects Technical Review Committee, which falls under SKIPA. The CBI Projects Technical Review Committee ensures that projects of very high standards are considered under the CBI programme by certifying that each application complies with the standards established by the committee. This is a very important component of the review process as it assures investors under the Real Estate Option of the CBI Programme that they will receive a product of very high quality for their investment. I would also, at this time, wish to commend SKIPA for the work the Agency has been doing in attracting Foreign Direct investment to our shores, along with the facilitation services and support provided to these investors resulting in the approval by Cabinet,” Hon. Grant declared.